Kuranda is a charming destination for locals, holiday-makers and honeymooners set against the magnificent Barron Falls, the lushness of the rainforest, and a melting pot of creative arts. Historically, Kuranda in the 1960s was the place to be for paradise-seekers pursuing an alternative lifestyle, where growing your own food, creating art and music, and unusual hand-built houses of bricks and timber were the homes of choice. The 1970s saw a community prosper, with the improved road allowing commuters to work in Cairns and live in the cooler climate of Kuranda. Open-air market stalls sold locally grown produce and an abundance of handmade wares, while buskers and fortune-tellers entertained the crowds. The Kuranda experience today is a delightful and unique fusion of all that has gone before, a diverse and happy village community where the people who live here have a deep appreciation of the beauty around them, and a cheerful welcome for the visitor. 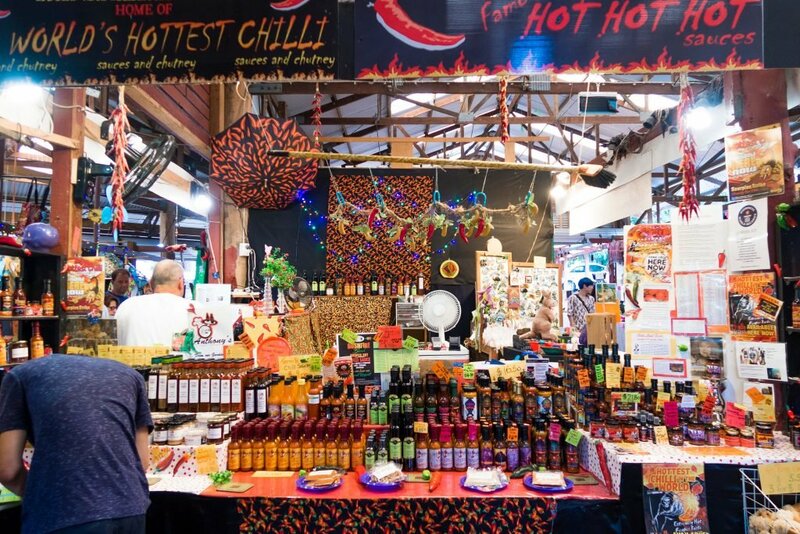 Leveraging off the artistic and imaginative, Kuranda is renowned for its markets with many of the current marketeers having been involved in the markets during the course of the last 30 years. Their local knowledge and expertise is second to none. The Village in the Rainforest has two market locations, the Original Markets and the Heritage Markets, both of which are open every day of the year. The Original Markets, located on the corner of Therwine & Thoree Streets, are as much an attraction as they are a local institution. In the 1970s, a group of local artisans and craftspeople established the markets in a bid to attract visitors to Kuranda to purchase their handmade wares. The scent of sandalwood and patchouli still linger in the air, evoking a time long gone but certainly not forgotten. This marketplace is not like most others – it conjures a feeling of whimsy and enchantment down its meandering pathways in the rainforest. Take time to enjoy a traditional tea ceremony at the Japanese Tea House or a relaxed snack of crepes and coffee at the Petit Café. Wander the rows of rainbow coloured market stalls and dip down secret pathways, uncovering quirky shops and buskers at each turn. Fancy a game of mini golf? The Kuranda Original Markets even has a 9-hole mini course available to play a round in the rainforest. Across the road on Rob Veivers Drive, the Kuranda Heritage Markets lets you experience the best of Kuranda in an all-weather covered market, with a wide range of stalls offering locally-produced souvenirs including handmade Karma Kuranda soaps and the hottest chilli sauces on the planet (CHALLENGE ACCEPTED!). The market, nestled in beautiful tropical rainforest, also features native wildlife attractions Koala Gardens, Birdworld Kuranda and the Australian Butterfly Sanctuary, as well as Frog’s Cafe offering a place to settle in to calm those hangry pangs whilst pouring over discovered treasures and watching portrait makers and dreamcatcher weavers perpetuate the market’s mystique. Kuranda Village hub on the corner of Therwine and Coondoo Streets extends the range of shopping and exploring opportunities with locally-focused retail stores all along the high street. For the sweeter kind of visitor, watch hungrily as award winning rock candy treats are handmade in front of your very eyes at the Kuranda Candy Kitchen, or try to resist the delights of Highland Whiskey Fudge at the Kuranda Fudge Bar & Tea Room. For something a little longer lasting, Kuranda opal stores offer the most Australian of all gemstones uniquely designed into keepsake jewellery to take back home. When next in the Tropical North, be sure to put Kuranda on your must-do list, and reclaim a little piece of magic from the Village in the Rainforest. Discover more markets and shopping precincts to explore in Tropical North Queensland. In addition to the bounty of scenery nature has provided, there are plenty of shopping opportunities in the village courtesy of a vibrant arts-and-crafts community and strong Indigenous heritage. Learn about Tropical North Queensland’s Colourful Quirky Rainforest Village.